Snorkel with Dolphins on White Sand Ridge. Liveaboard the charter yacht Dolphin Dream . Snorkeling with wild Dolphin is an experience of a lifetime and no where is better than the Little Bahama Bank. 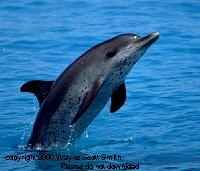 Atlantic Spotted Dolphins are fun loving sea mammals that are intelligent, friendly, and playful. Wild spotted dolphin of White Sand Ridge on the Little Bahama Bank enjoy swimming eye to eye with humans. Interacting in the wild with Spotted Dolphin is spiritually communicating with a highly intelligent being using body language. Possible they have been trying to interact with humans for centuries, but it has been only in the past few decades that humans have started to look at them as intelligent complex individuals. A young dolphin comes racing in to ride the bow wave of the Dolphin Dream. Dolphins of all ages like to ride the pressure waves that are created by the bow of a moving vessel. We go to the bow in anticipation to see who it is. Scott identified them as Notcho a young mother and Hali her two year old female calf. We go to the back deck and put on our masks, fins, and snorkels. Captain Robin stops the boat and we jump in to see if our friends want to play. The two dolphins come swimming excitedly around us. Then you make a free dive down to the white sand ridge with the dolphins. During the trios decent Notcho picks up a strand of seaweed with her tail and drops it in front of you. Then you pick it up and carry it a little way then drop it. Hali comes over and picks it up on her dorsal fin, she has it for a while then it's Notcho's turn again. They were playing pass the seaweed game with you. 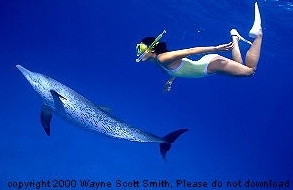 Snorkeling and free diving with wild dolphin you glide along side by side. These wild spotted dolphins come to play with us of their own free will. There has never been any feeding, training, or coaxing of any kind. It is a natural encounter with wild dolphins that are in complete control of the interaction. The relationship is voluntary based on trust, play, and curiosity. You need only a mask, fins, and a snorkel with dolphins. Make your dream a reality. Come with us to the White Sand Ridge the Bahamas.